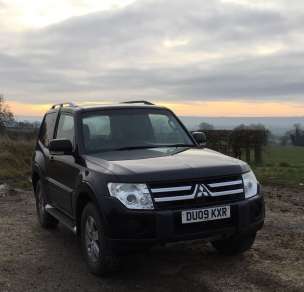 APRIL 2009 MITSUBISHI SHOGUN 3.2 DID AUTOMATIC 3 DOOR, 4 WORK, VAN, BLACK, 57,850 MILES, RCL, CLIMATE CONTROL, E/W, E/M, RADIO/CD, ROOF RAILS, RUNNING BOARDS, ALLOY WHEELS with 265/65R17 Tyres, TOW BAR WITH SINGLE ELECTRICS. SERVICE HISTORY. MOT OCTOBER 2019.